Are you looking for a versatile, all-in-one headphones that feature efficient Bluetooth and punchy bass? 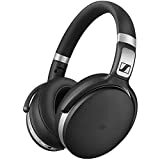 At this year’s CES, Sennheiser has announced the new Sennheiser HD 4.50 BTNC that set a completely new and vibrant standard among the best quality headphones. We’ve gotten to lay our hands on the Sennheiser HD 4.50 BTNC Bluetooth wireless active noise canceling headset that will leave you speechless. Built with comfort, warming and clear sound and no hum the HD 4.50 BTNC headphone features the elegant and attractive design, NoiseGard – the efficient noise canceling setting and NFC friendly Bluetooth 4.0 feature. Other features include a lasting battery of 25 hours and sharp, responding microphone. NoiseGard active noise cancellation to reduce ambient noise levels improving the listening experience. The Sennheiser HD 4.50 BTNC is probably the best model in its series, and are available for less than $200 for everyone who appreciates the best quality of music and futuristic build. We’ve exposed these headphones to a strict test, and we’re going to share the results with you. The HD 4.50 BTNC are pretty versatile and are eligible for every intention, from the regular day-to-day listening to the music to the gaming and audio production. The Sennheiser HD 4.50 BTNC ensure that cables are a thing of past. The manufacturers focused on a musical and physical freedom which is why there are Bluetooth 4.0 and AptX which yield great results in the quality of sound. This futuristic technology also features audio codec which is responsive for reliable transmission and Hi-Fi sound. The headphones also focus the Near Field Communication (NFC) which results in smooth and agile connection with the available device. We also took our time to test the range. In the manual we read, it was noted that the maximal range goes up to ten meters. We decided to test that and concluded that this information is quite accurate. However, there were occasional dropouts in the connection. If you move into the other room that is separated by the walls gives nearly same results. Don’t let this spook you, as the vast majority of Bluetooth devices are limited by the same boundaries. Mainly, the HD 4.50 BTNC were designed to be used with the smartphone nearby, but, there won’t be too many obstacles when used with other devices and moving away up to 5 meters. It is very important to test the sound quality with the right music on. If you’re testing with the music you’re not familiar with or fond of, that can lead to the unwanted results. Sennheiser designed the entire HD 4 series to fit together with the most of pop, hip-hop, electronic and rock genres. If you’re someone who tends to make their own playlist, that’s not a problem either, these headphones definitely appreciate everyone’s taste in music. If you want to test the headphones yourself it’s recommended to create a unique playlist that will help you get out the right judge. In terms of the sound quality, you can expect a warming and welcome sound output that doesn’t cease to exist even when the volume buttons are pushed to their limit. Crisp highs and the humming elimination ensures great musical experience without interruptions. Everyone who is looking for an elegant and detailed sound can rest assured that the HD 4.50 BTNC can offer much more than that. The bass is pretty strong and does a great job in supporting the punching sounds. As a result of such great basses, we can freely say that the Sennheiser HD 4.50 BTNC is the very fair opponent to the competition – Skullcandy and Beats by Dre. As a matter of facts, these headphones reproduce better sound than most of the headphones in the competition. Even when we’ve increased the frequency to the mid and high, we’ve gotten nothing but the flawless music reproduction. This is another model that features NoiseGuard active noise-cancelling setting. It is very efficient and it entirely removed the background sounds that can disturb you or prevent you anyhow from enjoying the right music. You can turn the NoiseGuard off very simply, by pressing both volume buttons simultaneously. In my personal opinion, this setting is amazing because it is intuitive and easy to use. There is also an effective option that allows you to talk over the phone without being completely cut off by your surroundings. This proves to be very helpful to those who want to listen to the music while walking around. The earcups have enough sound isolation to provide you a great time for listening to the music, without further interruptions like loud ambient and such. In order, to ensure spectacular music experience and highest durability without surprising battery dropouts, the manufacturer ensured that the HD 4.50 BTNC was etched with the Lithium Ion battery. Even though it might sound spooky, the headphone’s battery is permanent which means that it cannot be removed. Don’t worry, the manufacturers ensure us that these headphones and the battery were designed to last for the lifetime of the headphone. Additionally, charging of the battery is very agile, as they get completely recharged in only two hours. This is nothing compared to the 25 hours battery life of pure musical enjoyment. The 25 hours of battery life counts for the headphones being set without a NoiseGuard feature on. During our testing times, we used these headphones for several days but, we decided to turn on the NoiseGuard. We were very persistent with the headphones, and that yielded a great outcome. You will see no issues while using these headphones even at the full charge, there will be always some battery left when you’re through. Durable battery life is one of the most important features all headphones of this range should have. Sometimes, we’re exposed to the long and tiring trips and great music is exactly what relaxes us. Everything that you need to be found for your use, you will find on your ear-cup. The ear-cup has embedded controls that allow you to easily change the tracks and this is where the microphone is integrated. After testing headphones with several calls, everything proceeded very nicely. We tested in both Noise Guard on and off, in other to get the best results of these headphones working. The quality of the call was the best in the closed area while walking outside appeared to yield several obstacles. This problem appears on all Bluetooth headphones. The microphone has a good sound range despite being integrated. The voice appears sufficiently loud and in as good quality as the best headphones in this range. In terms of design, despite the ordinary look, the Sennheiser HD 4.50 BTNC still look very attractive and intuitive. Colored in black they also look elegant. On touch, they are soft and thick while the ear pads extend around the ear. On first look, it seems like they are tight over ear fit but they still manage to work fine and comfortable. It is hard to find the pair of headphones that will fit everyone. But, it is good to know that the Sennheiser HD 4.50 BTNC is absolutely comfortably sized to be portable. The only complaint that I feel regarding these headphones is the headband. It appears to need some more padding to be considered enough comfortable. Even so, the lack of additional padding won’t ruin anything. The manufacturers certainly always had in mind the portability over value. The headphones are not too bulky which is good because the listeners can enjoy the high portability and the headphones won’t feel too heavy on the head. Another great feature of these headphones is that they fit fairly in the canvas case, and they fit and look really good around the neck in case you need to put them off for a couple of moments. The headphones offer a great variety of features that ensure sufficient amount of quality for all listeners. The noise isolation is definitely the best feature of these headphones. Because it is well-known how much the listeners enjoy listening to pure music without annoying sounds from the environment. The sound quality is amazing and is customizable for every audio profile. Additionally, the HD 4.50 BTNC is very intuitive and easy to use. Perhaps headphones with this price tag will appear too expensive for several users. However, knowing that these headphones are wireless Bluetooth headset, they will probably change their mind. Additionally, just like its predecessors, the HD 4.50 BTNC is designed for the best audio quality and a durable use. Which leads us to conclude that this price is fairly accurate. Perhaps, the headband should have more padding. The Sennheiser HD 4.50 BTNC wireless headphone is absolutely amazing. It is very versatile and eligible for everyday use. Additionally, it has superior sound compared to other headphones in the range. These headphones are recommended for everyone who doesn’t settle for the mediocre quality of music and enjoys the durable battery for this price. We have made this small list of Similar Alternatives Over-ear Headphones which has Bluetooth Wireless connection, Active Noise Cancelling Technology and usually called as High-end headphones. We also have reviews of few items here. For a better rational purchase, have a look at those reviews as well. See full review of Sennheiser HD1 to know more. See full review of Sennheiser Momentum 2.0 Review to know more.